The post below is by the folks at data.world — a social network-like platform to find, collaborate on, and share data. Thanks to Rachel Downs, Ian Greenleigh, and Dashiel Lopez Mendez, whose data analysis allowed them to create the FOIA Predictor, a tool they describe below. Writing a Freedom of Information Act (FOIA) request can be frustrating, largely because it’s hard to know what the government agency receiving the request will do: respond, delay, ignore. A new tool from data.world may help. Our FOIA Predictor estimates the chances your request will succeed based on factors including word count, average sentence length, and specificity. By gauging the likelihood your public records request will be effective, you can edit before you even file it. Based on more than 9,000 FOIA requests since 2010 that were submitted to more than 2,400 federal, state and local agencies and tracked by MuckRock, our predictive model is 80 percent accurate. The tool is free and open-source, so anyone interested in helping improve the model can find the data on data.world and the code on GitHub. Curious how it works? Here are some of the findings we used to make the FOIA Predictor. Over time, government agencies responding to FOIA requests tracked through MuckRock have increasingly sent out their data in structured formats (that is, data already formatted in a table-like file, such as .csv, .json, .tsv or .xls, rather than a .pdf or .jpg). Between 2013 and 2016, government responses with structured data increased by 417 percent. Initial data suggests the trend is continuing in 2017. FOIAs that request data are significantly more specific and longer than non-data requests when measured by number of characters, number of words, number of sentences, and average sentence length. But successful data requests are more succinct. We measure specificity in terms of the number of proper nouns a request includes. This finding is statistically significant. The average successful data request has 8.9 proper nouns, while the average failed data request has 17.2 (see table). 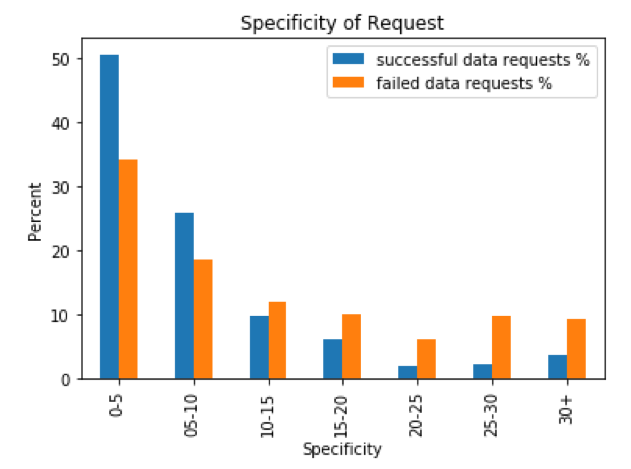 Data requests received responses (positive and negative) an average of 20 days faster than non-data requests. On average, successful data requests require waits of about 13 days more than failed requests. 27 percent of failed data requests mention paying fees to secure the FOIA response, while only 16 percent of successful ones do. Including additional information (like hyperlinks, email addresses, phone numbers and dates) does not seem to have any generalizable relationship to success. Response time for all requests (including failed requests) averages 46 days. You can find more details on these and other trends by viewing the complete FOIA Analysis dataset on data.world. 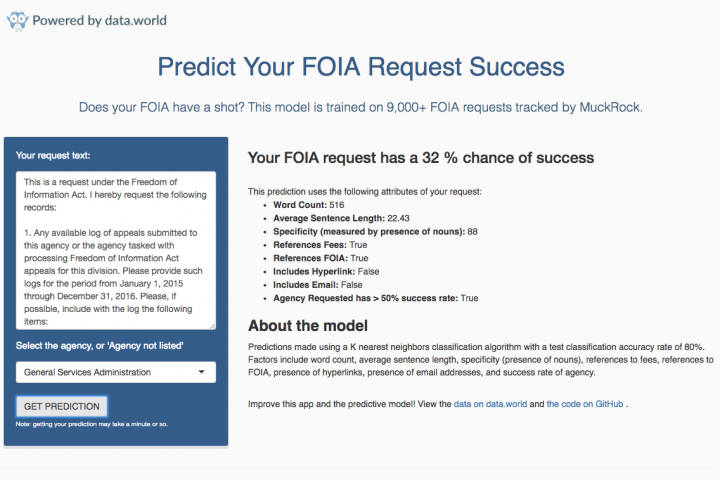 The FOIA Predictor model takes a draft FOIA text and the agency to which it is addressed and compares these with previous requests, collected by MuckRock, that have known outcomes. We built the FOIA Predictor as an open-sourced tool so others can leverage the findings. Have ideas on how to make the model better? We’d love your help! Submit a pull request on GitHub or request to be a contributor for the dataset on data.world.